I’ve been aware of the Inamo restaurant group for a while now-there’s one in Covent Garden and the original in Soho. 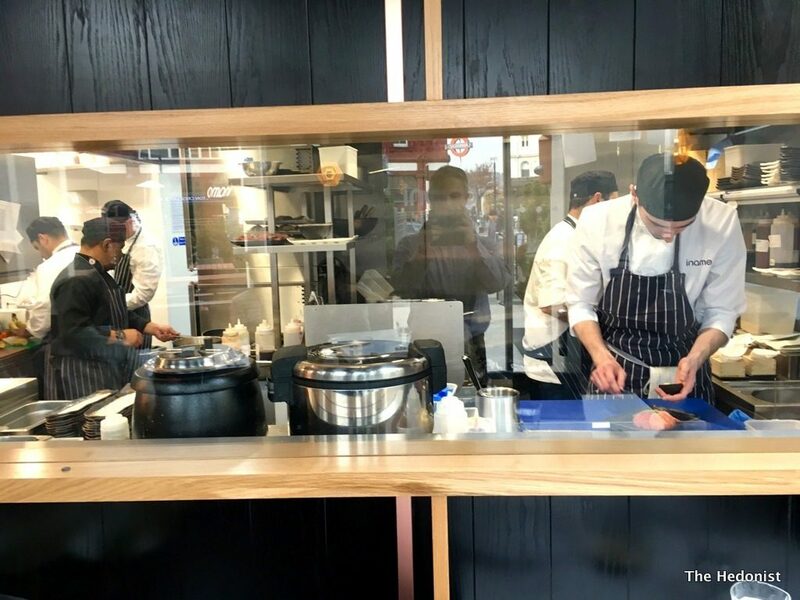 Somehow the self-styled ‘Space-age oriental fusion restaurant didn’t appeal conjuring up images of spacewalking waiters serving up little tubes of mashed sushi goo-extra wasabi anyone? So when asked along to review the new Inamo in Camden (handily over the road from Mornington Crescent tube) I was forced to confront my prejudices. 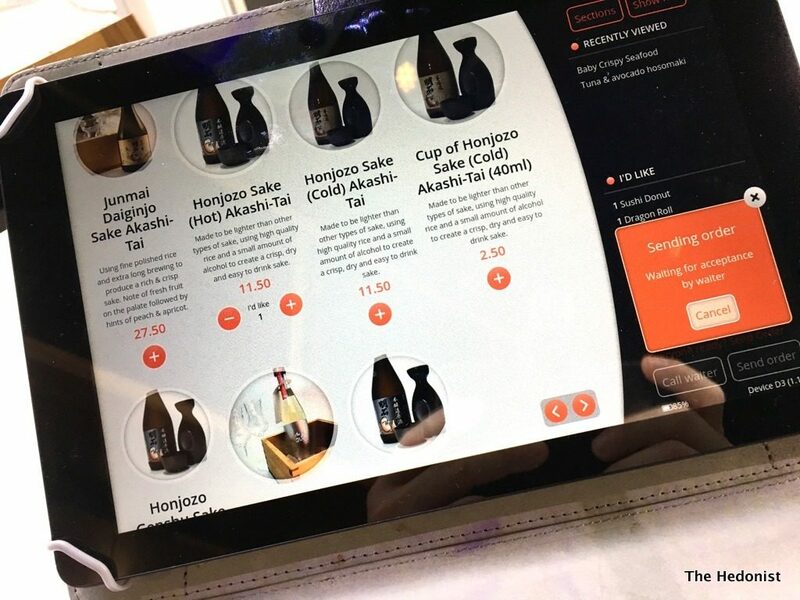 It turns out that you utilise a tablet to order your meal and can use your interactive table surface to choose your virtual tablecloth, view the chefs at work on ‘chef cam’, play games, & much more. Fiona and I went for lunch and in the daylight the interactive table was a bit pale to be much use but in the evening it could be a lot of fun. As we were sitting next to the kitchen the chef cam was a bit superfluous but the tablet ordering was easy and worked well. 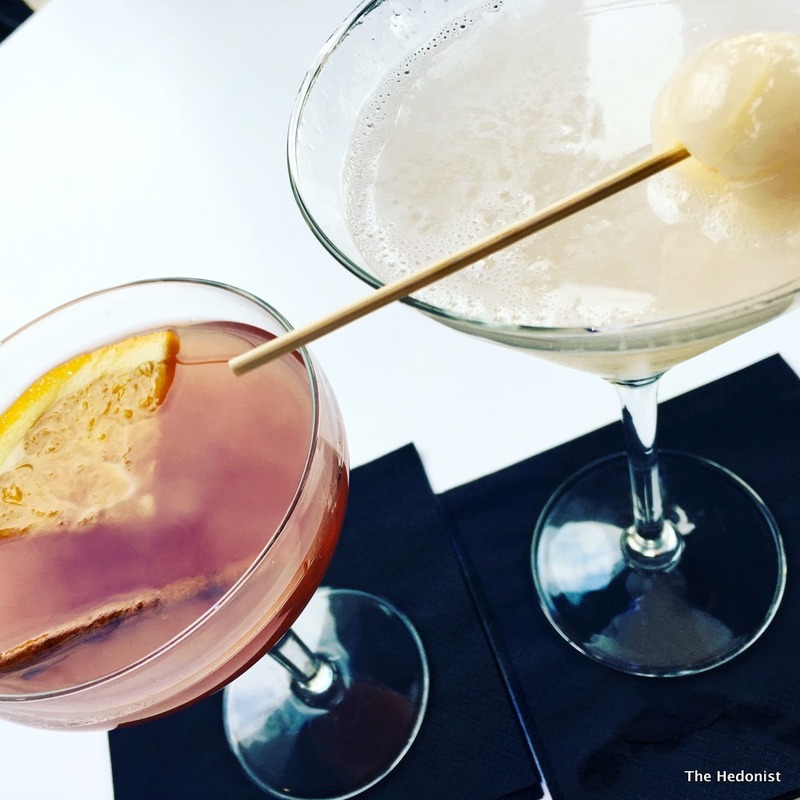 Because I wanted to test my theory that lunchtime drinking is a very good thing we kicked off with cocktails. Mulled sake (£7.95) was seasonally spicy and warming whilst a Lychee Martini (£8.95) elegantly balanced the tropical sweetness with the alcohol. 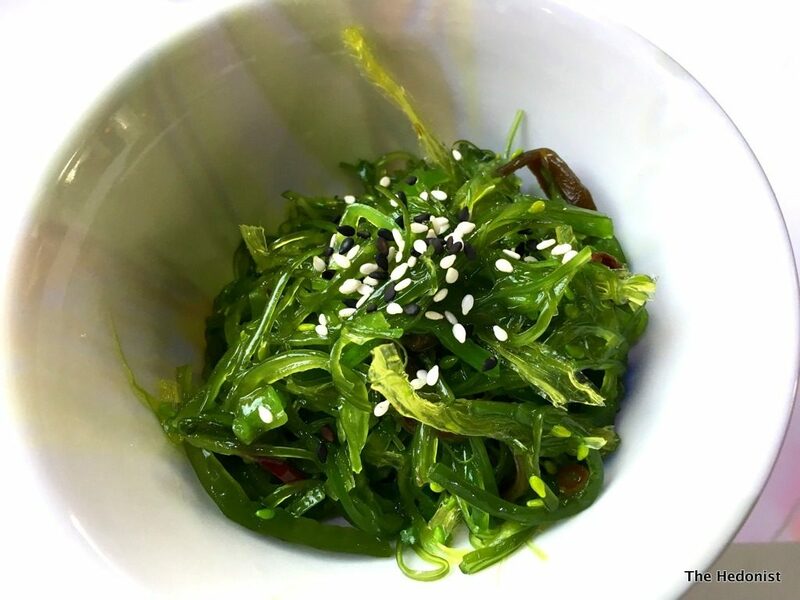 Seaweed salad (£4.45) was a savoury and refreshing blast of nutrients to counteract the alcohol. 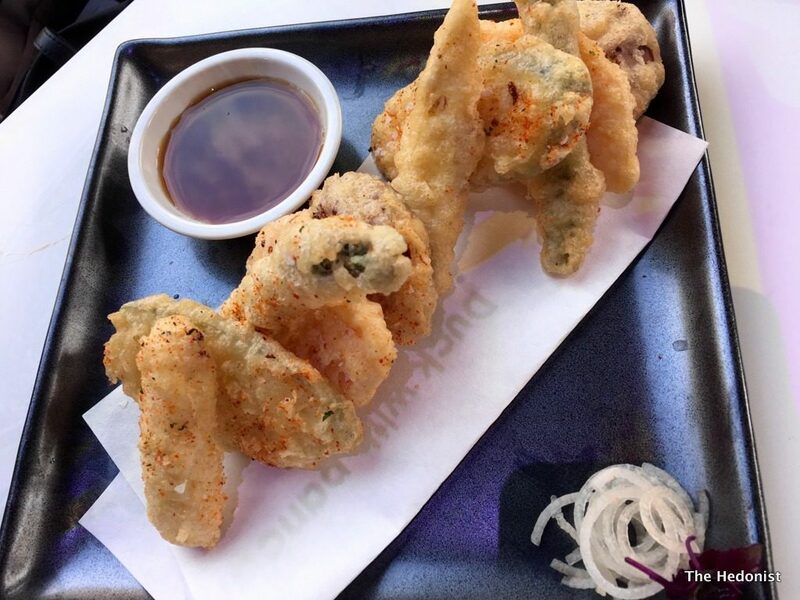 But after the seaweed it seemed important to have something deep-fried… Crispy vegetable tempura (£9.95) was hot from the fryer with a properly light and dry batter covering a interesting selection of vegetables. Perfect. 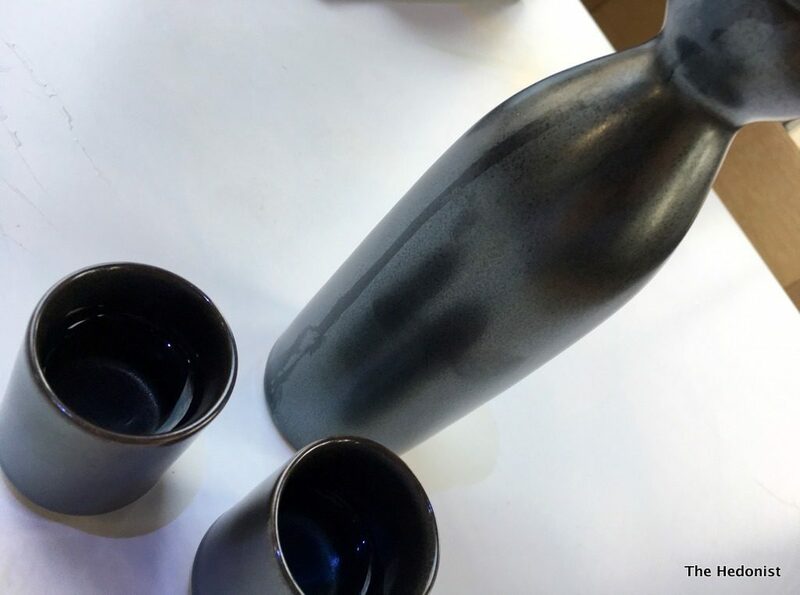 Honjozo sake (£11.50) was deliciously warming and a great match for our dishes. Sushi donut (£12.45) was much bigger than it looks on my photo. 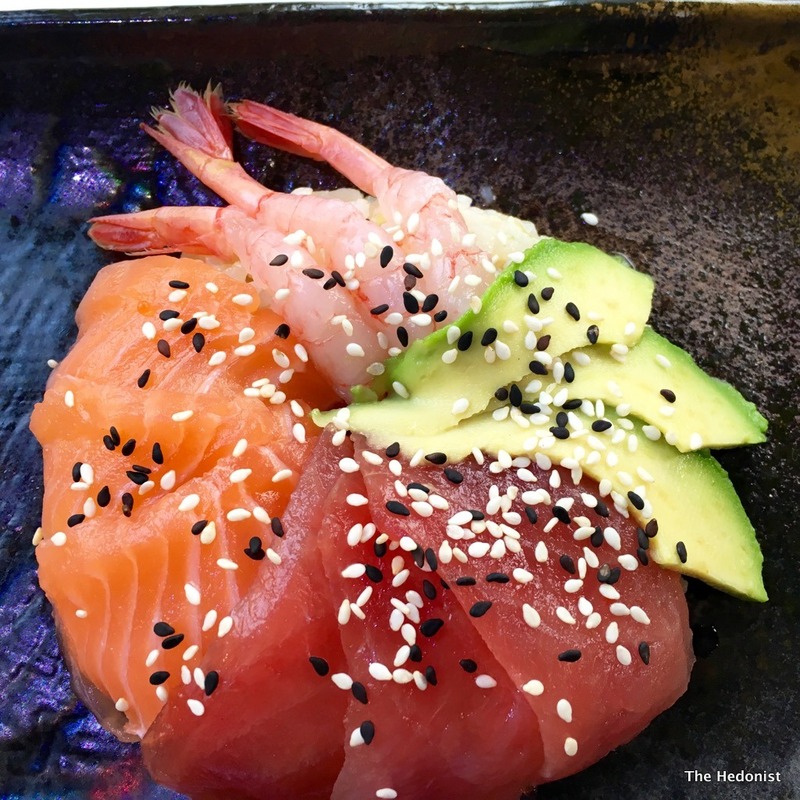 The sesame seed covered tuna, salmon, prawn and avocado lay on a bed of rice to create a good looking and tasting dish. 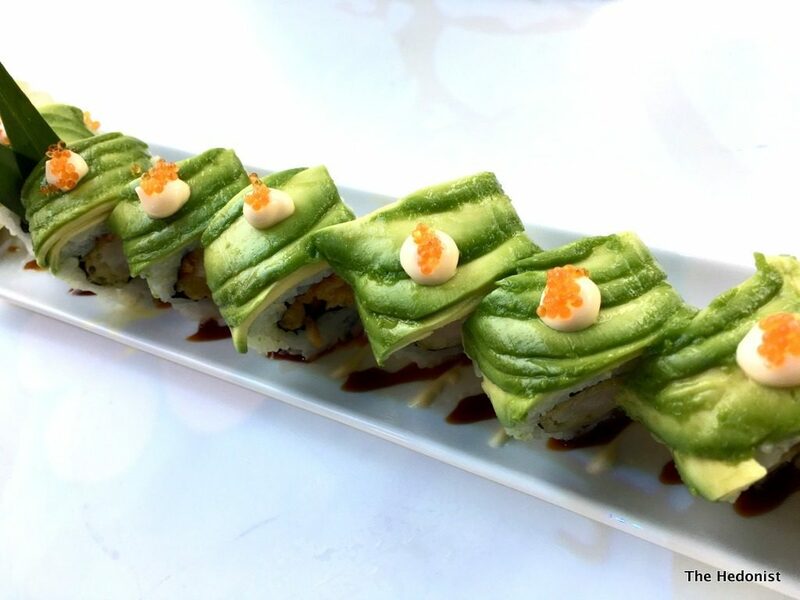 The eye-catching Dragon Roll (£11.95) was a construction of crunchy tempura shrimp, topped with creamy avocado and a touch of mayo. This would make a great sharing plate. 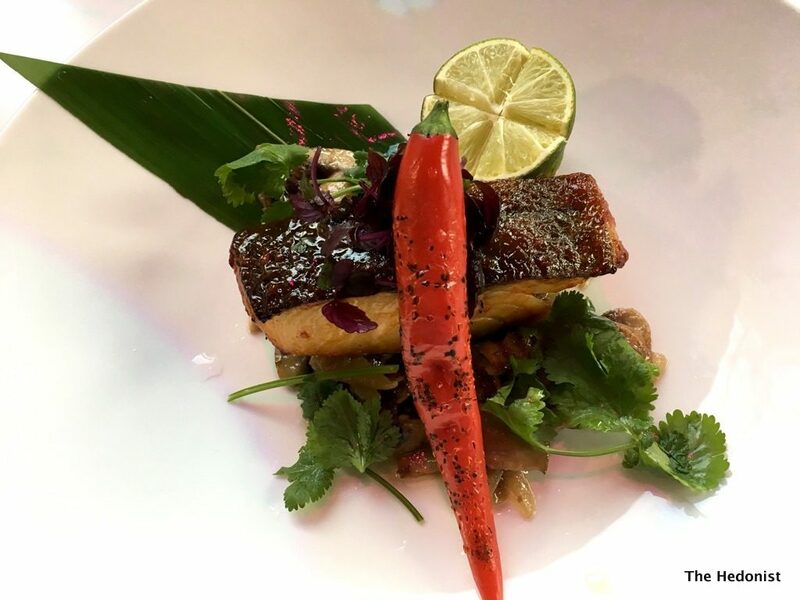 I first tried Black Cod in spicy miso (£24.95) at Nobu and then at Hakkasan. It has since become a staple on pan-Asian menus. This version was beautifully cooked allowing the sweetness of the fish to come through and a generous serving for the price. Fiona loved her Hot stone fillet (£19.95). 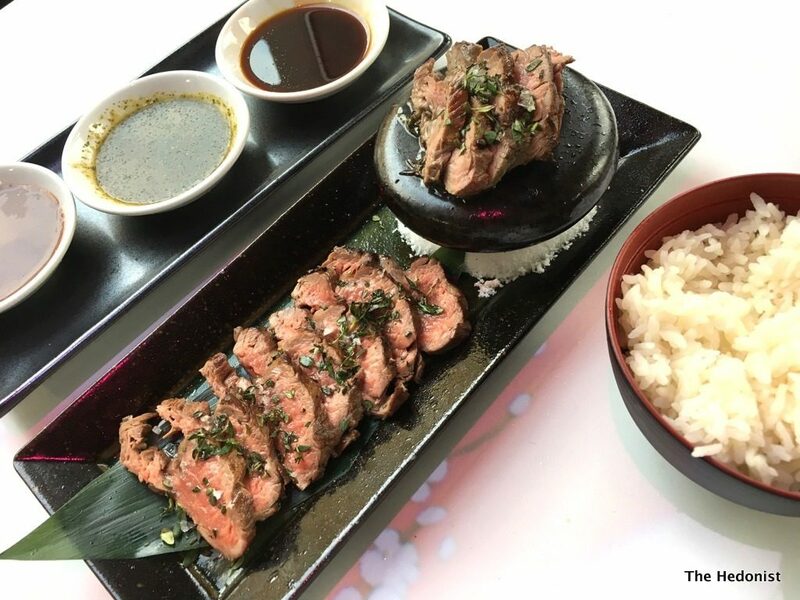 The tender English fillet tail came with three dipping sauces, Nam Jim, Teriyaki & Korean BBQ. You cook your own meat on the provided hot stone to your taste. Our waiter thoughtfully replaced the stone on a regular basis so it was always at a cooking temperature. We had planned to have a light lunch but sometimes the best laid plans…and there was no room for dessert which meant that the exciting sounding Baked Alasparkla went untried. 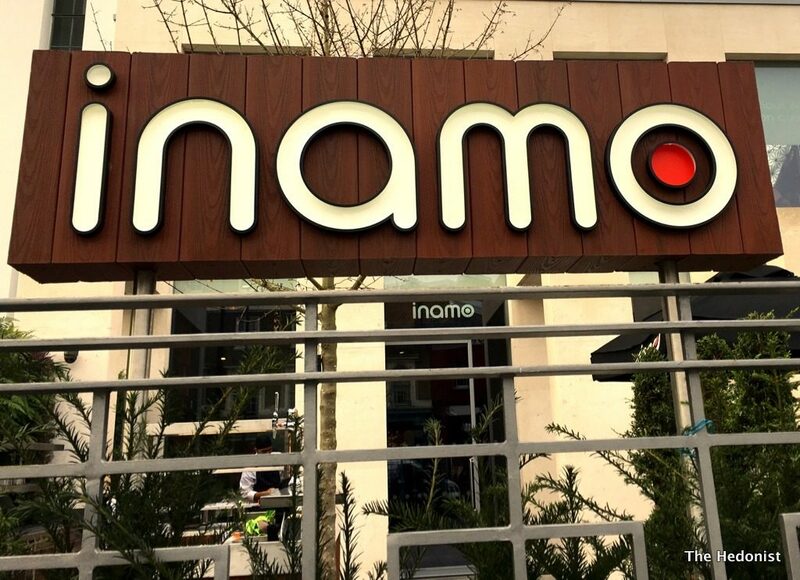 Inamo would be a great place for a fun date or an outing with family, friends or work colleagues. The food isn’t over-complicated and delivers really well at the price point. It’s well worth a space walk over to Mornington Crescent.